A grant program supporting research projects that seek to feature Catholic women more prominently in historical narratives is now available through the Cushwa Center for the Study of American Catholicism. 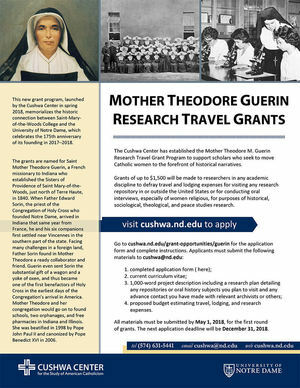 The Mother Theodore Guerin Research Travel Grant Program is open to scholars from any academic discipline and can be used to defray travel and lodging expenses for visits to research repositories in or outside the United States or to conduct oral interviews, especially of women religious. The deadline for the first round of applications is May 1 (Tuesday). Thereafter, the application deadline will be December 31 each calendar year. This latest grant offering from the Cushwa Center is possible through a gift from Anita McMahon, an alumna of Saint Mary-of-the-Woods College whose late husband, William McMahon, graduated from Notre Dame in 1950. The new program memorializes the historic connection between Saint-Mary-of-the-Woods College and Notre Dame, which celebrates the 175th anniversary of its founding this year. The grants are named for St. Mother Theodore Guerin, a French missionary to Indiana who established the Sisters of Providence of Saint Mary-of-the-Woods, just north of Terre Haute, in 1840. When Rev. Edward Sorin, C.S.C., the priest of the Congregation of Holy Cross who founded Notre Dame, arrived in Indiana from France, he and his six companions first settled near Vincennes in the southern part of the state. Facing many challenges in a foreign land, Father Sorin found in Mother Theodore a ready collaborator and friend. Mother Theodore even sent Father Sorin the substantial gift of a wagon and a yoke of oxen and thus became one of the first benefactors of Holy Cross in the earliest days of the Congregation’s arrival in America. Mother Theodore and her congregation would go on to found schools, two orphanages and free pharmacies in Indiana and Illinois. She was beatified in 1998 by Pope John Paul II and canonized by Pope Benedict XVI in 2006. This is the third grant program launched at the Cushwa Center since 2011. The center began offering Hesburgh Research Travel Grants in 2015 to support scholars traveling to the Notre Dame Archives to consult source material on the life and work of Rev. Theodore M. Hesburgh, C.S.C., who served as Notre Dame’s president from 1952 to 1987. Peter R. D’Agostino Research Travel Grants, inaugurated in 2011, support the study of U.S. Catholic history from international perspectives by means of research in Roman archives. The center’s original longstanding Research Travel Grant Program and annual Hibernian Research Award have been offered since shortly after the center’s establishment in 1976. Prospective applicants can visit cushwa.nd.edu/funding-opportunities for more information and application details. To receive Cushwa Center updates and the American Catholic Studies Newsletter by email, subscribe here. Originally published by Shane Ulbrich at cushwa.nd.edu on January 30, 2018.